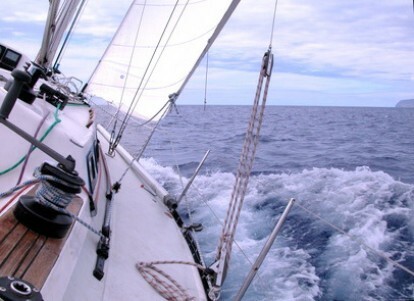 An RYA Yachtmaster certificate of competence is often the ultimate aim of many skippers. It is recognised worldwide as a highly respected qualification, proving your experience and competence as a skipper. There is no formal course to complete in order to become a Yachtmaster. If you have the necessary experience, you can apply for the exam. However, many Yachtmaster candidates choose to take a structured preparation course at an RYA Training Centre before the exam. Our course covers all the exam topics. It can be tailor made for specific needs and will help you to identify and fill any gaps in your knowledge. It can also help to prevent an unexpected disappointment! We run seven day, live aboard courses for Yachtmaster Exams. This includes five days of intensive preparation and two days for the exam. We provide the instructor and the boat, and the RYA provides the examiner. The exam will include an assessment of your skippering skills, boat handling, general seamanship, navigation, safety awareness and knowledge of the IRPCS, meteorology and signals. Candidates will be set tasks to demonstrate their ability and may also be asked questions on any part of the syllabi for all practical and theory courses up to Coastal Skipper level. A Yachtmaster Offshore is competent to skipper a cruising yacht on any passage during which the yacht is no more than 150 miles from harbour. 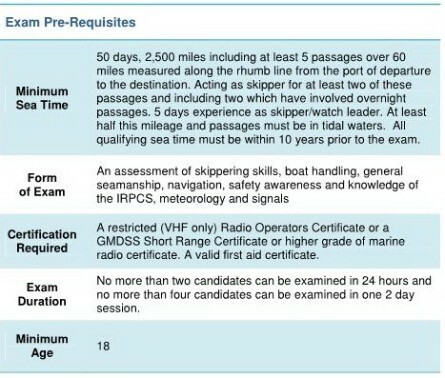 Full details of the exam syllabus and requirements are shown in the RYA's Sail Cruising Logbook (code G15) available from the RYA web-shop or from us. NB. The exam fee is in addition to the course fee and is paid direct to the RYA. If you want to work on board a commercial craft that is subject to the MCA's codes of practice, you will need to get your Yachtmaster Certificate of Competence commercially endorsed. A Yachtmaster Offshore can then work as the Master of a commercial vessel of up to 200gt in category 1 to 6 waters - that is up to 150 miles from a safe haven. A Yachtmaster Coastal can then work on commercial vessels up to 24m in length, operating in category 3, 4, 5 and 6 waters - that is up to 20 miles from a nominated departure point, in fine weather and daylight. 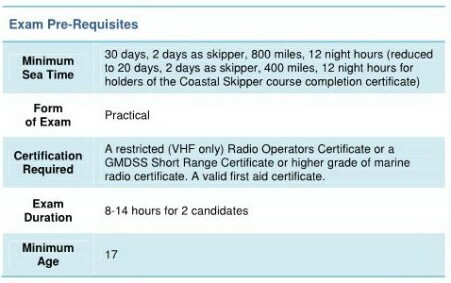 The RYA Yachtmaster Offshore Certificate of Competence can be used commercially in its own right. It is also a pre-requisite for the MCA's Officer of the Watch qualification, which enables you to work worldwide on vessels of up to 3000gt.